Emerita Paraben-Free Pro-Gest - 2 oz. Tube. Emerita Pro-Gest Cream has been a trusted leader in the midlife balance product market since 1978. The soothing, balancing cream comes in convenient bottles containing either a one-month or two-month supply. This cream contains natural ingredients such as aloe vera, sweet almond oil, safflower seed oil, and Vitamin E. Plus, like all Emerita products, it contains no parabens. Pro-Gest Cream Ingredients Pro-Gest cream contains 450 milligrams (mg) of USP Progesterone per ounce (900 mg per two-ounce tube). Each 1/4 tsp contains approximately 20 mg of USP Progesterone. Careful clinical research has shown this to be an effective amount to achieve natural balance. 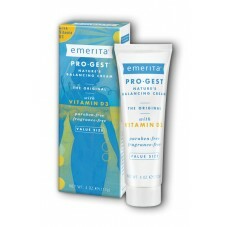 Pro-Gest Cream Directions from EMERITA Pro-Gest cream is easy to use. To apply, just massage 1/8 to 1/2 teaspoon into your skin twice a day. Apply it to your inner arms, inner thighs, abdomen or chest (above the breasts), rotating the areas where applied. Allow one hour for complete absorption before bathing. This is the same, great Pro-Gest® Cream formula trusted by women since 1978 for support at midlife, now with the fresh scent of lavender. Please note - Lavender Pro-Gest will not come in a box like the original 4oz tube as yet, Emerita do not currently have an international product package. 1. Emerita Paraben-Free Pro-Gest - 2 oz. Tube. Emerita is a leading brand of natural wellness products for women Since 1978. We get that question a lot. But trust us, there's nothing weird or hard about it. Just massage a dime-size dollop of cream into your skin twice daily. Try your wrists, arms, thighs, tummy - whatever you like. Contains 450 mg of USP Progesterone per ounce (20 mg per 1/4 teaspoon). Check the side of the box for a complete list of ingredients. No parabens, mineral oil, petroleum or animal anything. And our products are never tested on animals. 1. Emerita Paraben-Free Natural Lubricant - 2 oz. 2. Emerita Paraben-Free Pro-Gest - 2 oz. Tube. Emerita have turned up the heat on their range of sexual enhancement products with the excellent new OH Warming Lubricant. Research has demonstrated that nitric oxide produced by the body promotes blood vessel dilation in the female genital tissues. Emerita Response Cream is a topical formulation that supports this arousal phase with herbs and amino acids that support nitric oxide production and hormone balance. Emerita Paraben-Free Natural Lubricant - 2 oz. Emerita's Natural Lubricant can enhance your experience, whether you simply want more enjoyment or you want to relieve the mild dryness that sometimes occurs during your menstrual cycle or after childbirth. Our lubricant is free of mineral oil or petroleum distillates. Its water-based formula protects a woman's delicate vaginal balance. Emerita Paraben-Free Personal Moisturizer - 2 oz.